Prepare a dish inspired by Bamboo Restaurant’s Shanghai Chicken. It has to include chicken, chiles of some sort, vegetable greens, and nuts. It could be a known recipe or one of your own — traditional or newly invented. Blog about your dish or send me photos and a description of what you did and I will post about it here. So far not only Clayton and John/Sybaritica, but also Genie/Bunny Eats Design and Paul/That Other Cooking Blog have posted their takes on Shanghai Chicken. It is very interesting to notice how all of their entries are very different. Some more bloggers have announced that they will participate. I plan to do a wrap up of all the entries received so far next week. You can participate whenever you like, but if you want to be listed in my initial wrap up you should post something by Saturday, June 22, at the latest. Here’s my own take on Shanghai Chicken. I decided to keep it simple, and stay close to Clayton’s description of the dish. Broccoli greens are not available around here, so I decided to go with Chinese cabbage (also known as Napa Cabbage). You can also use broccoli greens or kale. I’ve been wanting to try a cooking technique called “velveting” for a while, and I decided that this would be a good recipe to try it with. I really liked the results and will definitely use that technique again. Based on Mimi’s hunch I used sambal oelek for the chiles. We really liked the final dish, so a big thanks goes to Clayton because without him I would never have tried to cook this. The combination of the chicken with sambal oelek and garlic went really well with the crispy cabbage, so I will definitely make this again. The only drawback was that the deep fried cabbage was a bit greasy. Next time I will try Clayton’s approach to roast the cabbage with a little oil in the oven. I roast veggies in the oven all the time, but had never thought of roasting greens in the oven before. That way, only a limited amount of oil is needed. This dish is quite easy to prepare if you are familiar with deep frying. It is very tasty and simple with ingredients that are easy to obtain. Sambal Oelek is sold in every supermarket in the Netherlands. If you can’t find it, you can easily make it from scratch using a recipe from John (straightforward) or Richard (fancy version). 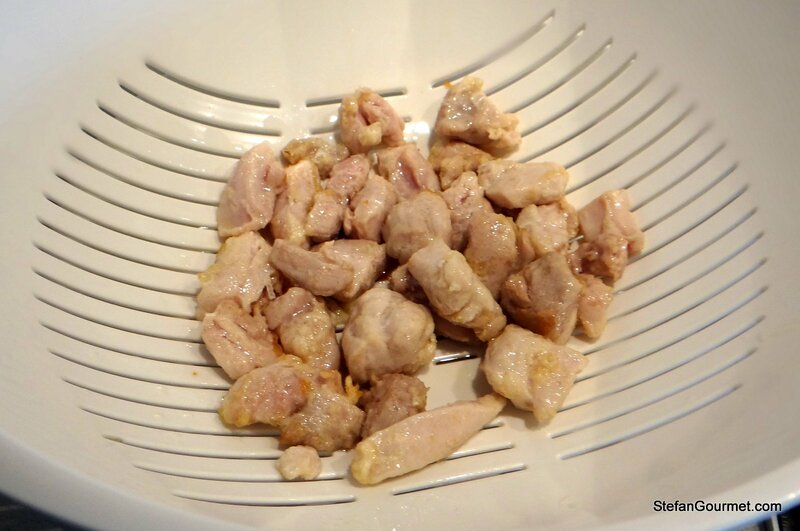 Cut the chicken into 1.5 cm (1/2 inch) pieces. 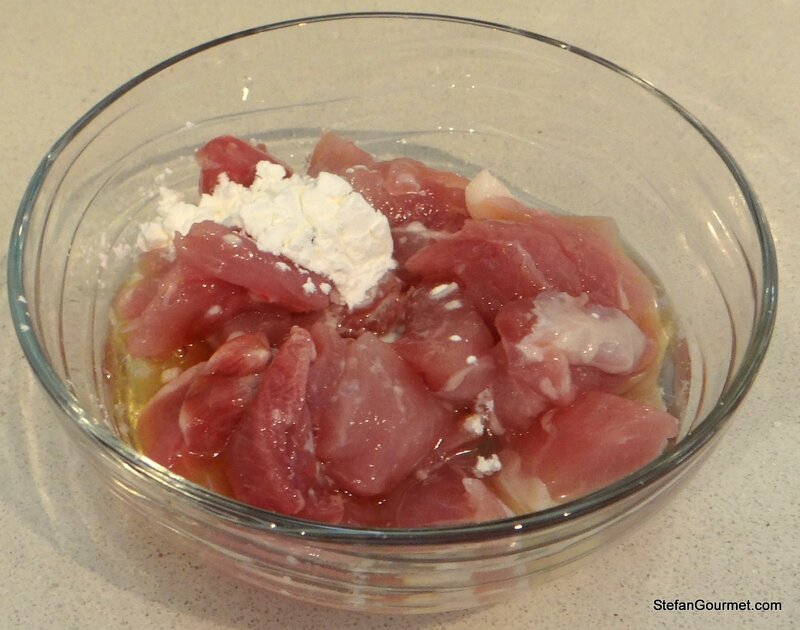 Combine chicken in a bowl with corn starch, egg white, and rice wine. Stir until the chicken is coated on all sides. 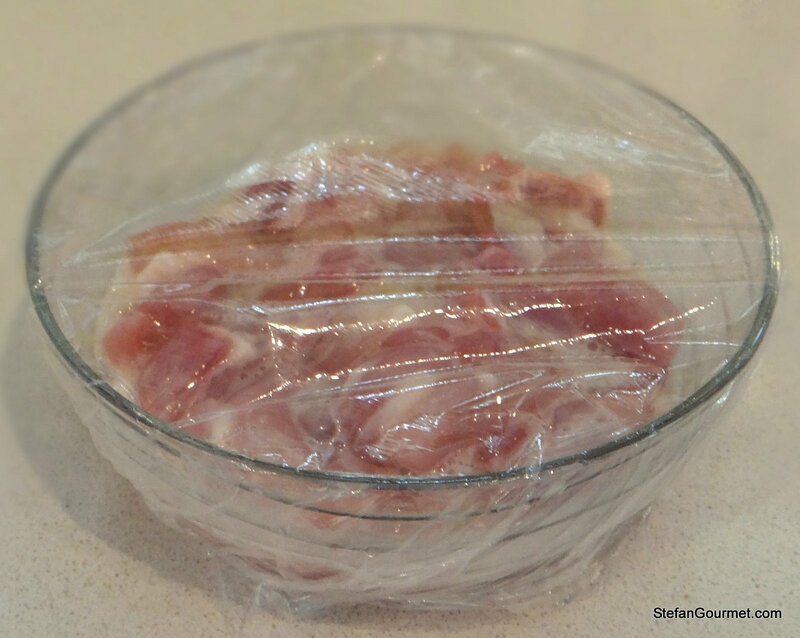 Cover with plastic wrap and refrigerate 30 minutes to marinate. Meanwhile, remove the stems from the cabbage so you will only have the leaves. 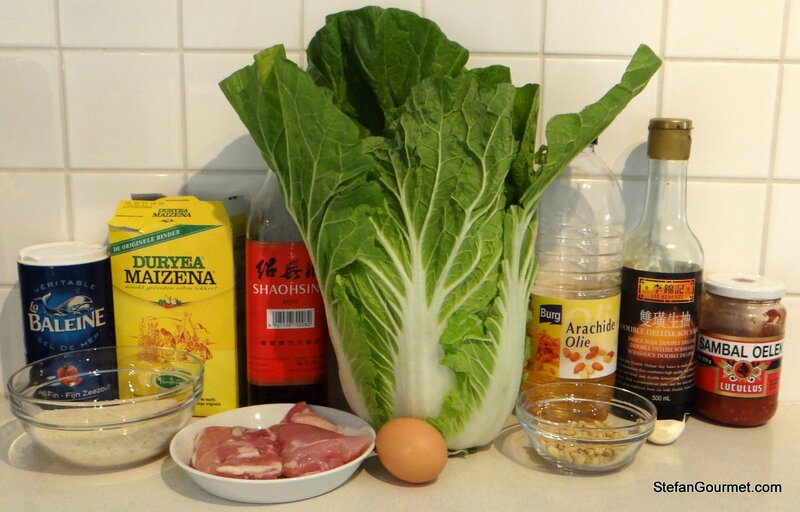 The stems of Chinese cabbage can be saved for another use; for instance they are great for a salad. Cut the leaves into pieces. You should have about 225 grams (1/2 pound) of leaves. Heat the oil to 180C/350F. 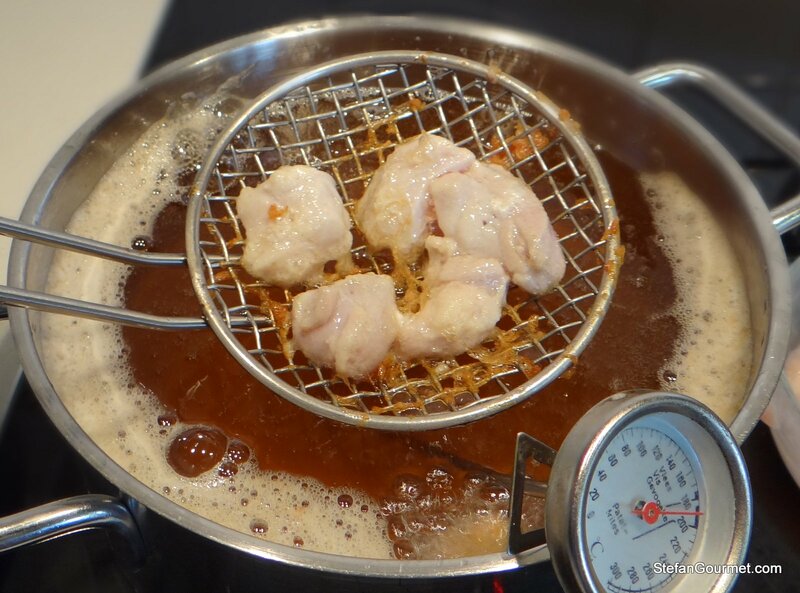 To ‘velvet’ the chicken pieces, deep fry them for about 30 seconds. The chicken only needs to be deep fried until it turns white. The chicken does not need to be cooked through at this stage, because that would make the chicken golden and crispy rather than velvety. 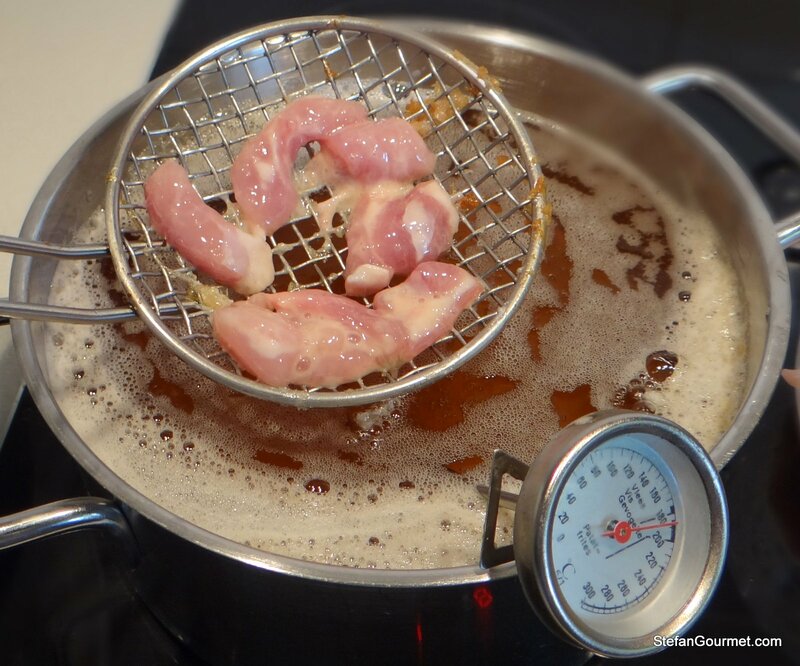 Allow the velveted chicken to drain in a colander. 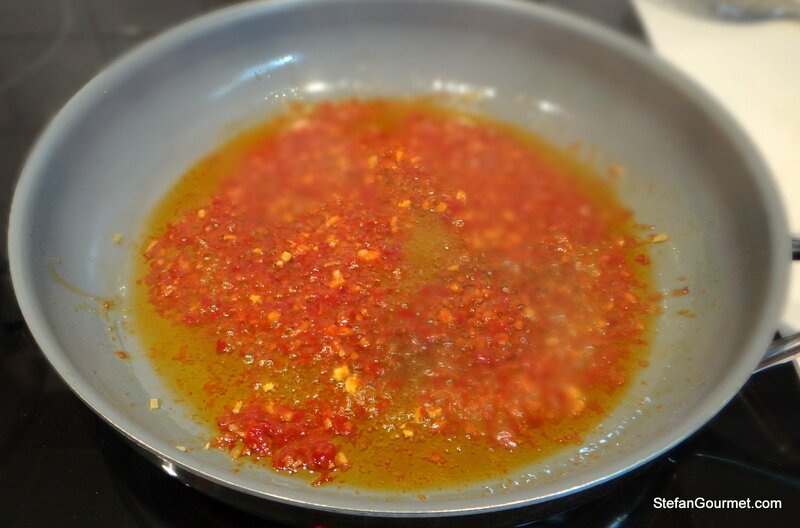 Heat a tablespoon of oil in a wok or non-stick pan. Add the garlic and sambal. Sauté for about 30 seconds. Do not allow the garlic to burn. 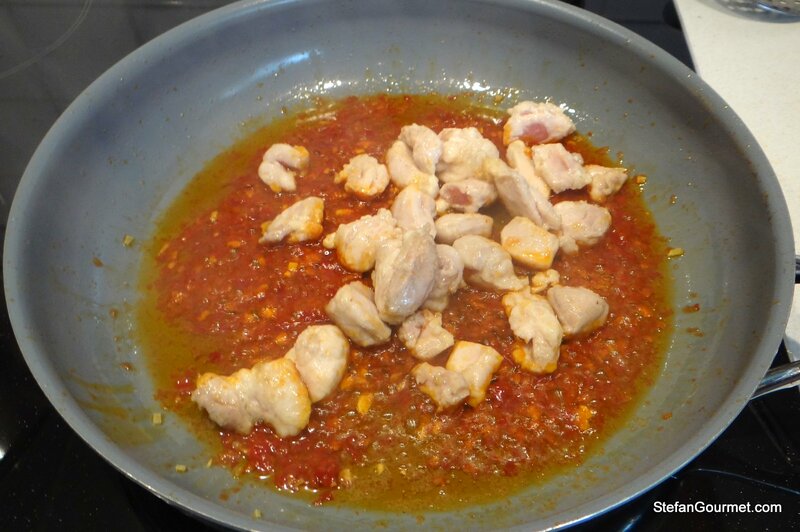 Add the chicken and stir-fry for 1-2 minutes. Turn off the heat and add the soy sauce. Stir to incorporate. Deep fry the greens in the hot oil (180C/350F) in batches. 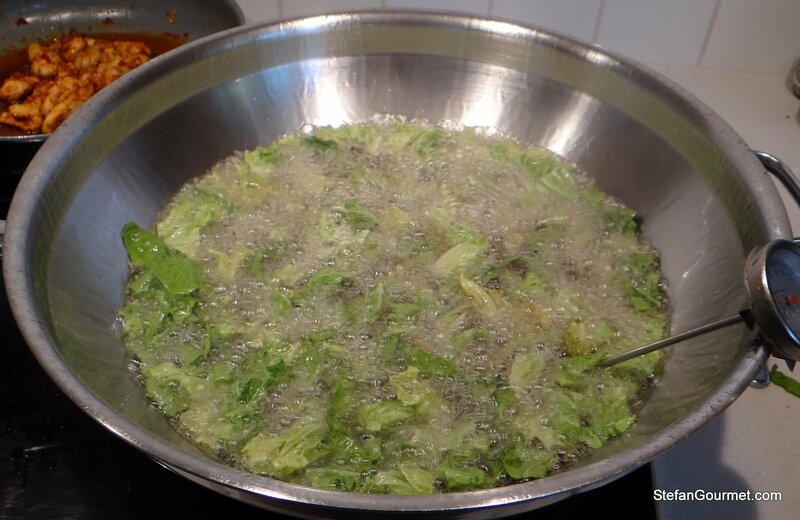 Make sure you do this in a wok, as the water coming out of the greens will otherwise make the oil boil over (I found this out the hard way). Next time I make this, I will try to oven roast the greens instead to make them less greasy. I don’t know yet whether that will make them equally crispy. 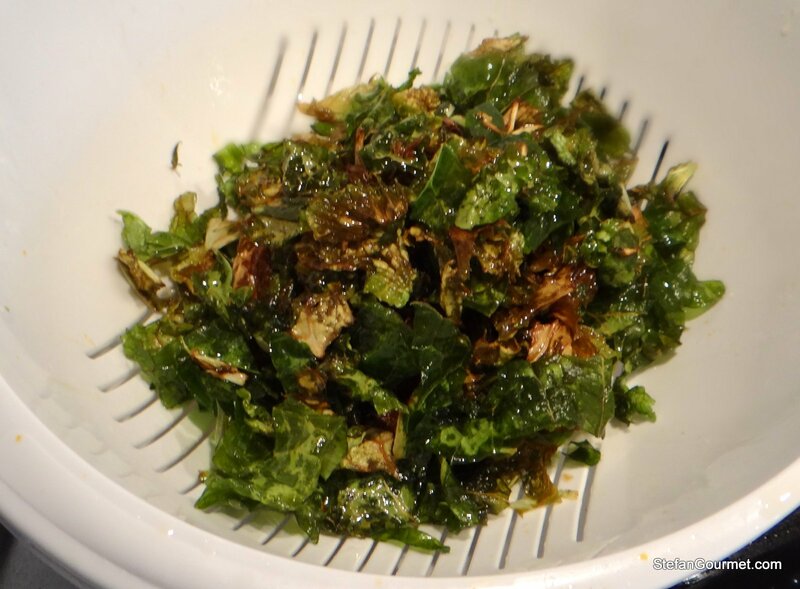 Allow the crispy greens to drain in a colander. 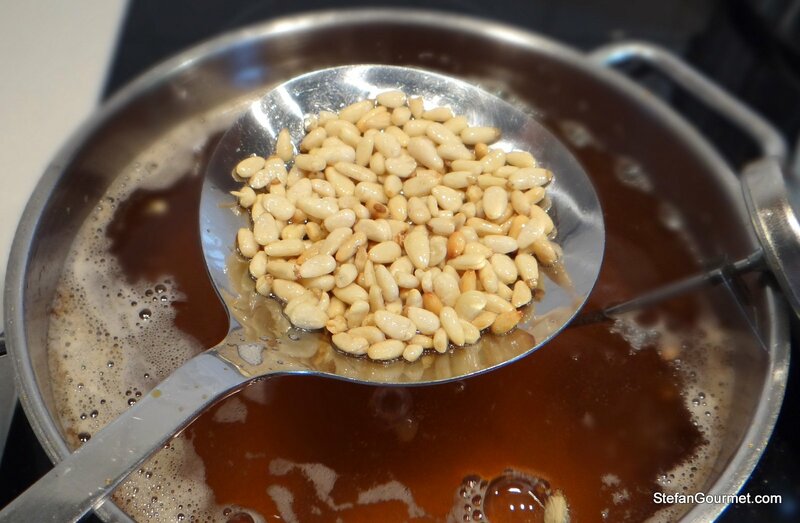 Deep fry the pine nuts for 30 seconds. In this dish, I prefer the light sweet flavor of briefly fried pine nuts over roasted ones. 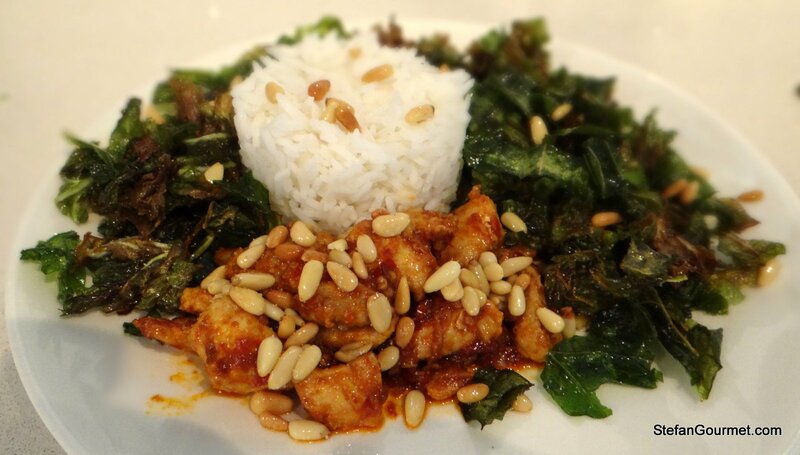 Serve the chicken on warm plates with the cabbage and rice, sprinkled with the pine nuts. You can mix up the greens and chicken if you like. They definitely taste great together. Pairs well with a fruity aromatic dry white wine, such as a New Zealand sauvignon blanc. Stefan, that looks wonderful. Velveting and then deep-frying the chicken pieces give them a wonderful texture. The sauce clings to them easily, too. I’ve never tried velveting, but I remember my father used to cook meat this way. Absolutely lovely recipe of the kind I most love! Since I never deep fry, stirfrying will be used both for chicken and vegetable side of broccolini or baby bok choi or pak choi. With practice velveting does work with stir-frying I have found. 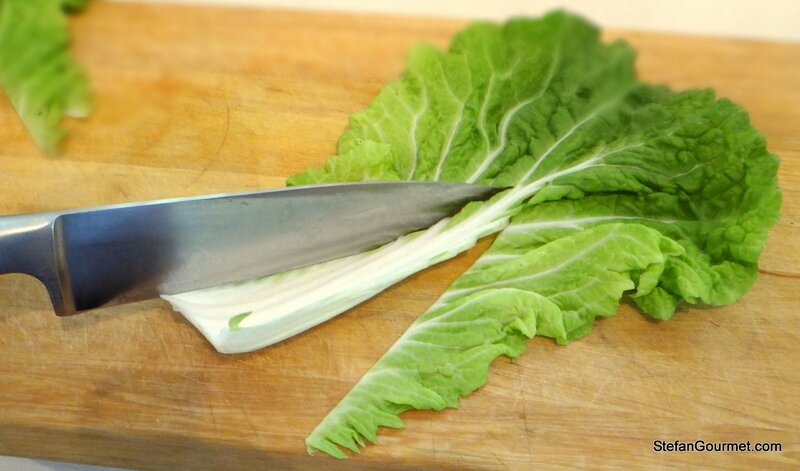 Quite interesting: Chinese cabbage as sold in Australia is almost white in colour and never has the green shown even on the outer leaves . . . all the things one learns . . . thanks!! 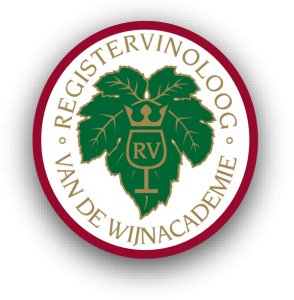 Eha … velveting can also be done in water as well as oil. Thanks, have not attempted it in water: have to look into it 🙂 ! Thanks 🙂 I wonder how to velvet when stir frying — what is the difference between the velveting stage and the stir frying stage in this case? That looks delicious, Stefan! I have a couple of questions, what’s velveting? never heard of it, sounds intriguing!. 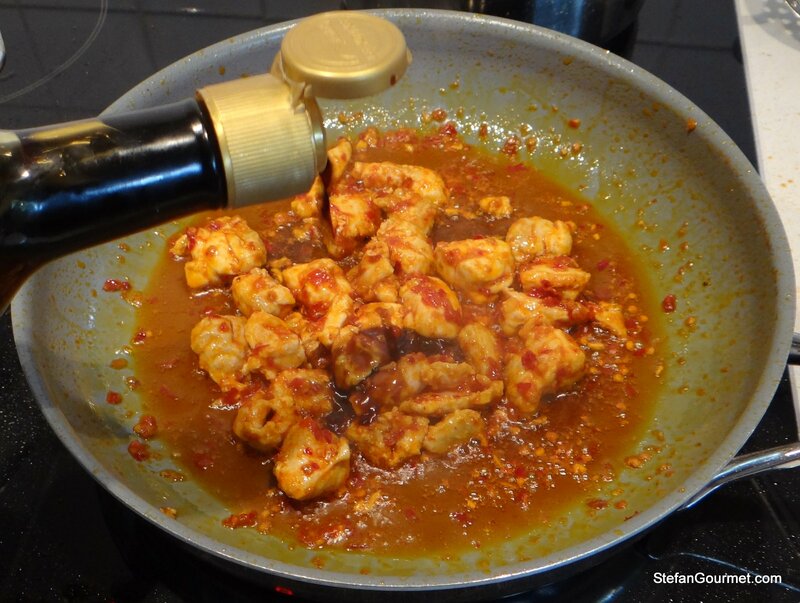 What’s sambal oelek? never heard of that either! Velveting is a technique used in Chinese restaurants in the US to briefly deep-fry chicken marinated in egg white and corn starch before stir-frying it. This will give the chicken a “velvety” outside and keeps it moist inside. 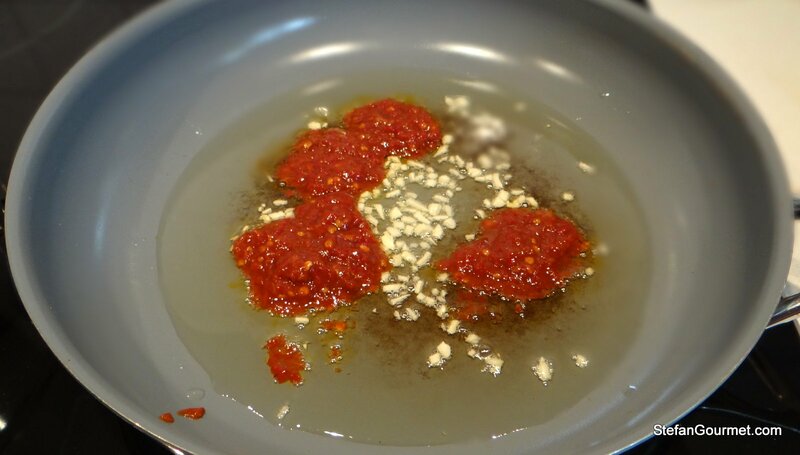 Sambal oelek is an Indonesian red chile pepper paste. nice, good to know! I never heard the term before but sounds clever, thanks! Nice take Stefan … I wish I had been as conservative in the amount of sauce I used as you were. Your chicken looks better than mine that way! Thanks, John. I was skeptical at first about velveting, but it really seems to work. Great photos – and fabulous project. Yes, roasting the Napa cabbage is almost like roasting kale; it lends a crisp and light finished product. Your Asian-inspired ingredients sound perfect for the dish. I REALLY love that you incorporated your love for Italy via the pignolis. Nice!